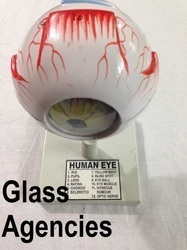 Glass Agencies EROSE are manufacturer of Human Eye . Glass Agencies EROSE are manufacturer and exporter of all type of Ophthalmic Instruments. Dissectible into 6 parts, showing both halves of sclera with cornea and eye muscle attachments and choroid with iris and retina, lens, vitreous humor mounted on a stand with numbered key card.. The different parts of the eyeball model are detachable to show the following structures. Refraction media: Showing the leans the vitreous body. Types: Teaching & Training Devices. This physical eye model can be used to demonstrate the optical functions of the human eye, e.g. 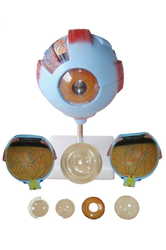 Description:The model shows the eyeball with optic nerves and muscles in its natural position in the bony orbit. Dissectible into 10 parts, 3 times enlarged. We are one of the most distinguished names in the industry for manufacturing high quality range of anatomy models like human Anatomy Models. These models are highly suitable in understanding the concept of human body in a better and reliable way. To retain our goodwill in clients' consideration, we are manufacturing, exporting and supplying an excellent range of Biological Eyes Model.